Another view of the jug. 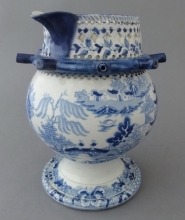 A pearlware puzzle jug printed in blue with the Two Temples II, variation Broseley, Reversed pattern and floral border pattern on collar. A blue ground has been added to the beak and circular band of tubular spouts designed as drinking spouts. A decorative pierced design has been added to the neck of the jug. The globular center shape has a pedestal base. Coysh and Henrywood in Blue and White Printed Ware, 1780-1880, Vol I, p. 292, provide the following description of a puzzle jug: "A jug with a pierced neck around which there is a hollow tube with three or more spouts. This tube is connected to the interior of the jug by a hollow handle. The drinker is challenged to empty the jug without spilling any liquid. This can only be done by suction through one spout when all the others, together with the hole in the handle, have been covered."